How did it get to be 2015 already? This was one of the fastest years yet. Really. I felt like everything was in fast forward. Except I wasn't running around like someone on a video in FF mode. At least I don't think I was? That would require me to run. And that's funny. Make cookies at least 4 times this year for fun - just for me Yep, I did do this. I made them for fun, handed them out to friends and family. And it was nice. Honestly, it was really nice just to make them and not have any pressure. Boom. DONE. Make videos of decorating to put on the website ummmmmmmmm.....I've got nothing to say other than fail. Epic fail. For this is now going back on my 2015 goals. Bring it on. Work on perfecting my airbrushing technique It's not perfect. But it's better. I'd say aside from perfecting my airbrushing technique I need to perfect a place to actually spray them. So I don't have airbrush color ALL OVER EVERYTHING. That or I need to invest in more 409 cleaner and paper towels. Develop new flavored cookie recipes for chocolate, pink lemonade, blueberry, & pistachio sugar cookies. Nope note even close. I did make chocolate ones via LilaLoa, and I printed off recipes for a bunch of others but did I try to make them? No. No I didn't. My husband is even begging me to make different kinds. So I guess I'll have to do that in 2015 or he'll stop making me cookie cutters when I need them. That's a threat and a promise. Attend a cookie conference (CookieCon 2014! - I'm already signed up) COMPLETED! And it was awesome. Now to decide if I can attend 2015....I just have to see how much vacation time I have available! Figure out how to make "characters" aka people with faces that don't look morbid! Good question....did I? I'm not sure. I think I can still work on this. Thankfully or unfortunately I didn't have many orders of things that needed people faces. And heaven forbid I just practice on my own, right? Bad Annie. Use at least 15 of the cookie cutters I've bought but never used This I'll admit is an epic fail. Why you ask, well because I had plenty I've never used...and I sorta bought a lot more this past year. What is my problem? I need a self help group. I've been saying that for a few years now! Work on taking better photos of cookies and the process of decorating - think step by step directions. Kinda. Sorta. I'm not letting myself off the hook for this one. 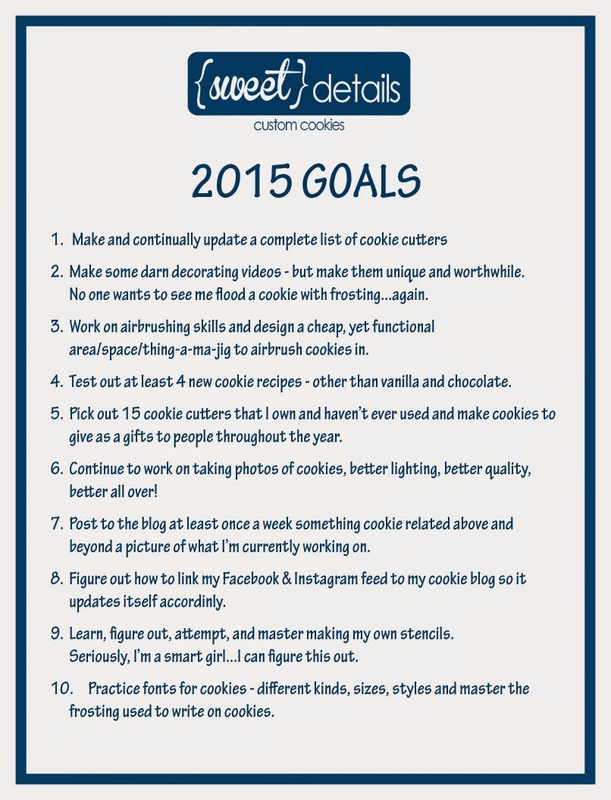 It has to go back on 2015 goals. Develop 5 new football cookie designs (for those Husker football weekends) Is it bad if I don't know if I completed this or not. I forgot it was even a goal. I made cookies for other Husker Athletics...like the Husker Basketball team here, and a bunch on my Instagram page here. So I think I've done ok...but still room to improve. So you ask...what's up for 2015. Other than the fact that it's already started and we're in 5 days to the new year. Nothing. Yet. I have been thinking about new goals. And knowing that to complete them I've got to keep them in the forefront of my mind. So I got myself a cork board...and it's going up. And these are the goals that are going to be listed on there! So there you have it. 2015 all wrapped up in a pretty little navy bow. I've gotta run. I need to start figuring out how to accomplish all this. Here's to a new year and new goals!